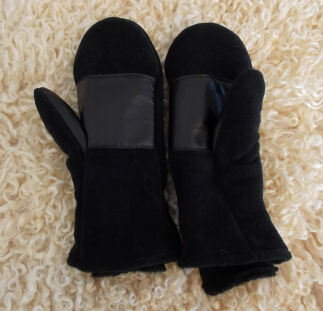 The outer cover of black polar fleece cuts the wind, while protecting the cozy inside, and a strip of kid hide on the palm prevents slippage on the steering wheel of a vehicle. The inside liner is made with 75% Kid Mohair and 25% Nylon. Sizing is based on the measurement between the tip of your middle finger to the bottom of your hand where it meets the wrist.